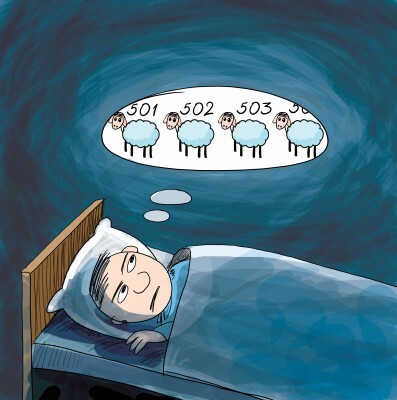 The Blunt Bean Counter: Oh Those Sleepless Nights - What is Keeping You up at Night? Oh Those Sleepless Nights - What is Keeping You up at Night? What is keeping you up at night? That is one loaded question. It may be a financial issue, a family issue, a business issue or in my case, the sub sandwich with hot peppers I ate at 10:00 pm last night. All joking aside, this is a serious question and everyone from psychiatrists to financial consultants asks this question or a variation of it when meeting a new patient or client. If you had asked me twenty-seven or so years ago whether this question would have any relevance to me professionally, other than from a financial perspective, I would have looked at you like you were crazy. However, as I look back over my career, I am amazed at how often I have been a psychologist/psychiatrist to my clients and how often money issues are intertwined or even secondary to family and personal issues. Analyzing sleep loss is a skill set I was not taught in university or in any of my Chartered Professional Accountant courses. on non-financial matters. Thus, today I will focus on the observations I have made over the course of my career in relation to financial matters that have kept my clients up at night. It is extremely difficult to solve complex problems by yourself. It is vitally important when you have significant financial issues keeping you up at night that you speak to someone who can provide objective financial advice (your accountant, financial planner, investment advisor or a close friend). When one experiences a significant financial issue, it has been my experience that he/she loses perspective and fails to see the forest for the trees. Speaking to someone you trust implicitly who knows both your financial situation and your personality provides you with a detached, non-emotional perspective on your financial issues. Most financial problems are not immediately solvable. From excessive debt, to funding your child's education, to fluctuations in foreign currency causing the cost of goods in your business to rise dramatically, the sad truth is that time is often the only answer and the sooner that fact is accepted, the better. Whether it is the slow process of putting an actionable debt reduction budget in place, the many years it takes to fund a RESP, or cutting back on costs to offset foreign currency fluctuations and/or wait out a reversal in those rates, in each case, time is the only answer. Thankfully these instances have been few and far between, but the saddest moments in my career have been those where a financial problem was not solvable. The typical situation where this occurs is when a once successful business is careening towards bankruptcy because of technological changes, competitors outsourcing to a low cost country or just plain business mismanagement. These situations are very complex. Often the person is a long-time client whom I have gotten to know on a personal basis and I have to tell them they need to close their business (this would be last resort advice after all other alternatives have been exhausted). This advice often leads to confrontation because (a) the client’s self-worth and net-worth often revolve around their business and (b) the client’s own solution is typically to throw more money at the problem; while I am trying to prevent throwing good money after bad to ensure they still have resources once the business is closed. In the end, all a financial advisor can hope for is that the client eventually realizes their situation is not fixable and begrudgingly, takes your advice and conserves their remaining resources. make that decision as wisely as possible -then forget it. The moment of absolute certainty never arrives. Think about that last line, “The moment of absolute certainty never arrives”. Whether a decision is financial or personal, it has been my experience that often, people are frozen in their tracks with indecision and cannot take action on their issue until they feel they have found that moment of certainty. However, we all know that moment very rarely identifies itself or if it does, often it is not in a timely manner. That is why I love this quote. Time constraints often force us to deal with an issue before there is certainty and those people who make the best decision under the circumstances and move forward without regret or second guessing themselves are best equipped to solve and deal with their issues, even if the decision does not turn out to be correct. Today’s blog is not technically related to tax, business or investment advice but sometimes general life advice is worth far more than income tax or financial advice and is definitely cheaper :). Bit of business advice I received years ago that revolves around sleeping. I was told that if you wake up three mornings in a row stewing about a business issue, that on the third day you just need to simply resolve it - quit worrying about costs or difficulties, and just fix the problem. It's not for everything, but I've used it with some success. For example, years ago I had a difficult client (another life insurance agent, purchasing software from me). I worried for three days as to how to make them happy. On the third day,they got an email telling them they'd be happier with one of my competitors than they clearly were with me. What a sense of relief. Well, at least until they refused to leave my services and go to my competitors :). Thx Glenn, not a bad piece of advice for certain issues. May be too simple for others. I don't get much sleep in the nights. I try really hard but I still can't sleep because I always think of my financial problems like paying debts and student loans and it keeps me up till midnight. I hope it will end soon so I can get a good night's sleep more often.